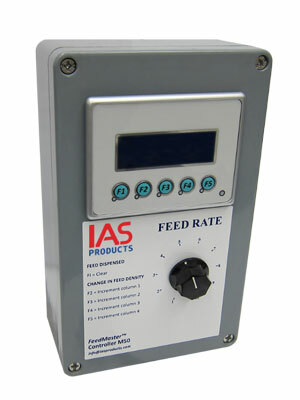 The FeedMaster™ Fish Feeder Controller M50 provides farm operators with multiple time scheduled feed dispensing events. Large IP68 rated input buttons matched with a bright digital screen ensures quick and easy access to set and read feed time and quantity parameters. The M50 operates on same 12 volt DC power as any of our IAS Products Ltd model AeroSpreader™ and AutoSpreader™ fish feed broadcasters and prawn feed dispensers. Each FeedMaster™ M50 Controller utilizes a proximity sensor to control feed hopper dispensing with the digital screen displaying both feed rate and total feed volume dispensed. The screen also displays the 1 to 9 daily timed feed event ‘rooms’ along with the room’s operator entered feed volume. All Weather Access IP 68 rated components and large control buttons for easy gloved operation. Highly Visible Screen Display High contrast display screen for best viewing and operation on brightest of days. Low Energy Consumption 12vdc operation and low amp draw works with all AeroSpreader™ and Autospreader™ fish feeders. Solid State Components Tough duty proximity sensors and control modules insures system reliability and accurate feed metering for best FCRs. Versatile Application 1-9 Feed Event times, each with independent operator set duration and feed dispense volumes provide best fish feed profiling for optimum growth. Accumulated Feed Dispensed Totals Tracks all feed delivered for accurate control of FCRs. Feed Rate Display Assists operators to minimize feed waste by delivering feed at optimum fish consumption rates. Time: 24 hr. period set by operator. Rate: Operator set and screen displayed. Volume: Operator set, auto stop when reached. Recording: Total dispensed feed volume since last operator cleared.